Vegetables don't care about borders, and even if piquillo peppers are considered a Navarran specialty, neighbors next door in La Rioja claim some rights over the celebrated peppers. 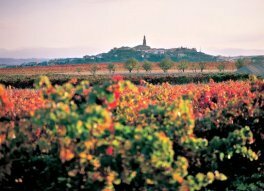 Here, they are stuffed in the manner of Logroño, the capital of the region and a good starting point for visiting a number of excellent nearby wine cellars. Begin the recipe the night before serving to allow the meat to marinate. In a mortar, pound together 2 of the garlic cloves, 1 1/2 teaspoons of the parsley, and 1 tablespoon of the water until a paste forms. Place the veal and pork in a bowl, season well with salt, add the garlic paste, and mix well. Cover and refrigerate overnight. In a skillet, heat 1/4 cup of the olive oil over high heat. Add half of the grated onion and saute for 5 minutes, or until shiny and tender. Add the veal and pork mixture, decrease the heat to medium, and cook, breaking up the meat with a wooden spoon and then stirring constantly, for 5 minutes, or until the meat starts to crumble a little. Transfer to a bowl and let cool. Add the jamon, 1 of the eggs, and the bread crumbs to the bowl. Mix well and reserve. Drain the piquillo peppers in a sieve or colander placed over a bowl. Measure 1/2 cup of the brine and set aside. In a small saucepan, heat 1/4 cup of the olive oil over medium heat. Add the remaining grated onion and saute for about 5 minutes, or until it starts to turn golden. Meanwhile, in a mortar, pound together the remaining garlic clove, 1 1/2 teaspoons parsley, and 1 tablespoon water until a paste forms. Add the garlic paste to the onion in the saucepan and mix well. Add 1 teaspoon of the flour, stirring to incorporate with the onion. Add the pepper brine, increase the heat to high, and cook, stirring, for 5 minutes. Decrease the heat to low and cook the sauce for 10 minutes longer, or until thickened. Remove from the heat, let cool, and then pass through a food mill fitted with a medium plate held over a large cazuela. With a small spoon, carefully fill each pepper with the meat mixture, taking care not to tear the pepper by overfilling it. Close the opening of each pepper by gently folding the edges. Spread the remaining flour in a shallow bowl. In a bowl, combine the remaining 2 eggs and the milk and whisk them together lightly. In a large skillet, heat the remaining 1/2 cup olive oil over high heat. One at a time, lay the peppers in the flour, coating them on both sides and shaking off any excess, and then dip into the beaten egg and set aside on a plate. When the oil is hot, add 5 or 6 peppers, decrease the heat to medium, and fry for 2 minutes on each side, or until browned. Using a slotted spoon, transfer the peppers in the same way, always making sure the oil is hot again before adding the next batch. Just before serving, place the peppers in the cazuela with the sauce, place over medium heat, and heat through. Serve hot.